So, at the moment I’ve really been craving Thai food. I don’t know why exactly, but there’s something so special about all of the fresh flavours and spices in Thai dishes. 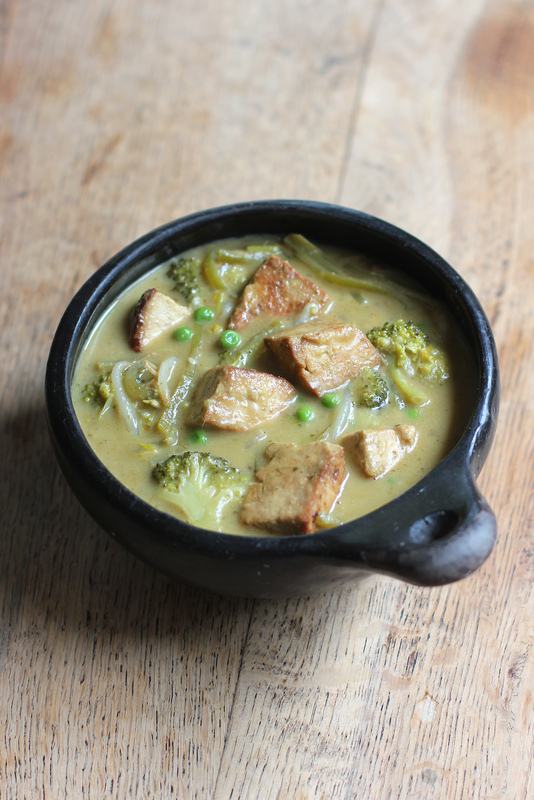 My all time favourite Thai dish has to be a Thai Green Curry. I just love its creamy coconut flavour, mild taste of lemongrass, and subtle heat of chilli. All together, it’s a dish that’s filled with an endless amount of delicious flavours, carefully blended and combined together to create a curry that’s rich and irresistible. Of course, with this recipe, I wanted to make a curry that was that bit extra special. So, for the tofu I decided to fry it in a mixture of sesame oil, soy sauce and coconut syrup. Doing this created a firmer texture for the tofu, and coated it in a delicious sauce with a slightly salty/sweet flavour. For the sweetness, I used Bali Nutra Coconut Syrup – I only used 1 tsp to keep the sweetness very subtle, but to enhance the flavour and texture of the sauce. It made a delicious addition to the tofu, and I have to tell you that Bali Nutra is definitely the best Coconut Syrup I’ve ever used. Before, I’ve found that some varieties can be slightly tangy, but this has a delicious, aromatic and mellow sweet taste. It was perfect for this dish, and if you’re interested in the product, you can buy it here from Amazon. When it came to the curry sauce, I used two tins of full fat coconut milk to create a smooth, creamy consistency. However, I found in other attempts that this alone didn’t make the curry thick enough (it can be so tricky the consistency right with thai curries!!). So, later I found that spooning in 1 tsp of tapioca flour and 3 tbsp of coconut cream near the end gave the curry it’s well needed final boost of creaminess. If you don’t have tapioca flour at home, then I would recommend trying plain flour or corn flour in its place- as they’re probably closest in consistency (although I haven’t tried this). For flavour, I used thai green curry paste, ginger, garlic, chilli and vegetable stock to create a vibrant dish that’s still fairly mild in heat. If you prefer it hotter, feel free to use a spicier chilli or add in some chilli powder/puree! Overall, this has a nice, refreshing taste and still feels quite light to eat, whilst providing you with a good, comforting feeling. Yum! I hope you like it! 1. Firstly prepare the tofu. Remove it from the packet, lightly squeeze out any excess water and dab it dry. Then chop it into bitesized cubes and set aside. Next, mix together the syrup, oil and soy sauce into a small bowl (it will appear separated). Then, pour this mixture into a good quality non stick frying pan, and tilt the pan so that it’s evenly covered. Then place the tofu pieces onto the pan, and move it onto a medium-high heat. Fry the tofu pieces on one side for about 1-2 minutes, then flip and cook for about 1 more minute on another side. Then, gently stir/flip the tofu with a spatula around the pan to coat the other sides for a further 5 minutes, until each side is golden, slightly crisp, and almost all of the liquid around it has gone. Then remove them from the heat and set aside until later. 2. Next, make the curry sauce. Add the coconut oil into a pan, followed by the garlic, ginger, chilli and spring onions. Fry them together on a medium-high heat for about 1-2 minutes, stirring. Then, add in the curry paste and lime juice, followed by the broccoli and green beans. Stir all of them together and continue to cook for another 2 minutes. 3. When this is done, add in the tins of coconut milk and the vegetable stock powder. Stir together, and leave it to bubble/simmer, stirring occasionally for about 17-20 minutes to reduce and thicken. Then, add in the tofu, peas and bean sprouts, followed by the flour and coconut cream. Stir all of them into the curry, and cook for a final 3-5 minutes, to thicken and become creamy. When the curry has thickened, removed it from the heat and then serve it with rice/noodles etc. You create some of the most flavorful dishes, this one sounds absolutely amazing and I am dying to try it! Whether condensed milk, coconut milk and desiccated coconut can be substituted for coconut syrup!!. Thank you so much Harriet. Thank you so much Anu!! Love it! Just want some rice with it now! looks great! What a great way to use curry! Admittedly I don’t use curry a lot as I don’t have much experience with it. In restaurants, I sometimes find it too strong or overwhelming, but I love how you rounded out the flavor from the curry paste with ginger and red chili. I also love that you made this dish creamy – it looks and sounds so decadent, but in a healthy way (if that makes sense?? hehe!). Gorgeous job, Harriet! Thank you Beeta! It can be so difficult sometimes to find the right curry, there are so many types! I like Thai green as it’s not too hot, and the creaminess balances out the flavours so it’s not too overwhelming :). Haha I love it! Definitely ‘healthy decadence’!! Maybe that should be my thing now??! I adore green curry. This looks and sounds so flavorful and yummy Harriet. I love Thai food but I’ve always felt intimated to make it at home. You make it looks so easy though! And delicious. I need to give a try soon! Ah! I just got Thai red curry paste for a new recipe I’m making this week! Ahh awesome! Can’t wait to see it!! ooo YUM! I’m terrible at making my own soups but this sounds fabulous! 😉 and I love all the flavors you put in the curry sauce! I love the flavors in this dish! I’ve never tried green curry before, so now I’m intrigued. What a delicious bowl of comfort food. Yum! My husband would love this. He’s a huge tofu curry fan. I’m going to surprise him with this for dinner! This looks so comforting and delicious! 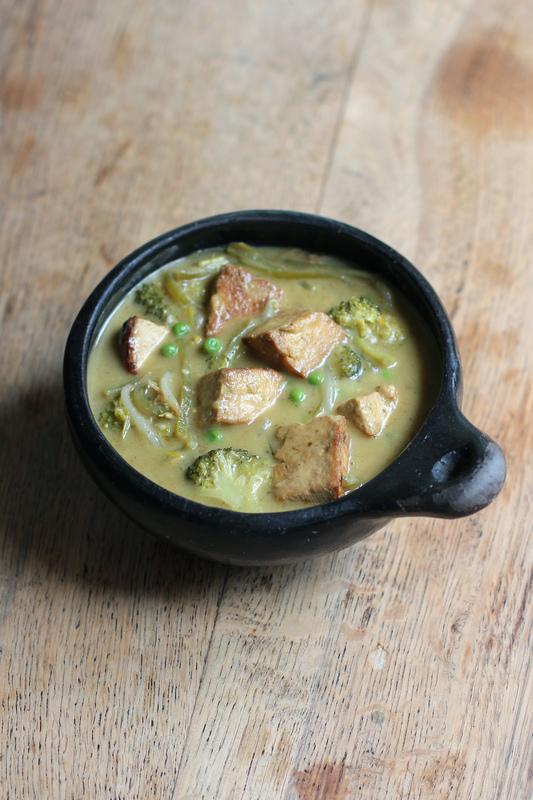 I love Thai green curry and the tofu sounds perfect in here! I’ve never seen coconut syrup before but it sounds fantastic! Love this recipe! This is a stunning dish! 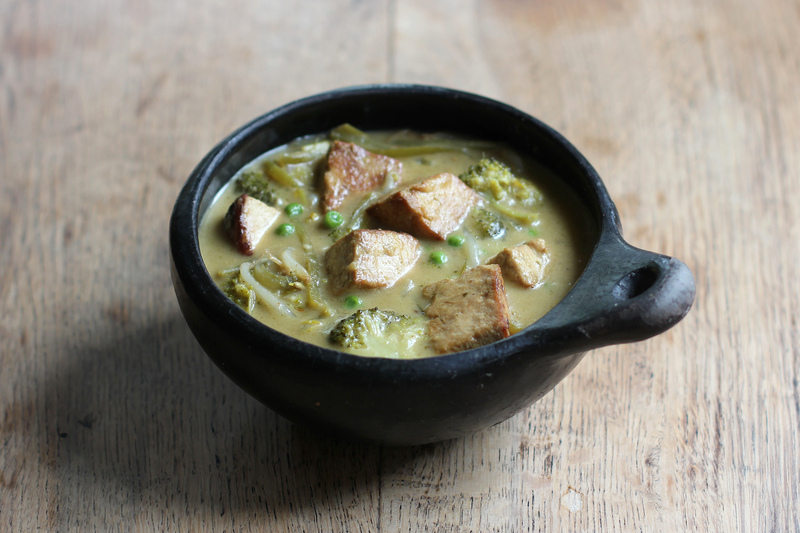 But would you believe I have never tried Thai green curry? I’ve never really been exposed to too much of that dish and I don’t like strong tasting coconut in soups or dishes, so I’m not sure if I would like Thai curry, but I do know that I love all those spices. You create some of the most amazing flavorful dishes! just wanted to say thanks…i’ve made this with a few adjustments as i was doing a storecupboard, clean out the fridge kinda meal…soooo i used 1 tbsp of green curry paste (leftover and was really really hot and too hot for the kids last time i made a curry with it) i only had one tin of coconut milk so i used that and washed out the tin to get every last bit with soy milk, i didn’t precook the tofu like you said coz i’m slack so just added the soy/tamari and sesame oil along with the curry paste….i’ve also left out the vege stock cube as i just tasted it and it’s banging with great flavour already and i don’t want to add anything else to it in case i ruin it…i’ve only got broccoli and frozen peas but that’ll do and i’ll add those 5 mins before we eat (i’m making it at lunch to have after errands, and school pickup and before busy evening running around)..the soba noodles will cook in 4 mins and that’ll be job done….adding the garlic ginger and spring onion will be a permanent change to any thai curry i make with a shop bought paste in future. thanks again and if i get around to it i’ll precook the tofu and make it as directed next time 🙂 coz i’ll definitely be making this again! !